Tickets are now on sale for this special talk by Taplow historian Nigel Smales, which ties in with our Story of Skindles exhibition. 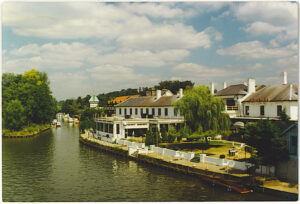 From an 18th century inn at Maidenhead Bridge, Skindles developed to become ‘the most famous hotel in the world’, frequented by princes, politicians, pop-stars and the rest. 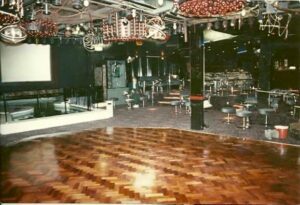 In the early 1980s La Valbonne nightclub at Skindles was voted the best nightclub in the world, and many local people have shared their memories of the club. “In 1985 our daughter met her future husband in the Valbonne” wrote one visitor to the exhibition and “Met my man in the swimming pool” wrote another anonymous visitor! But in 1995 the doors closed for the last time and the building lay derelict for 20 years. Now top-end housing is rising on the site of the iconic hotel. Nigel Smales traces this amazing part of Maidenhead and Taplow history in this fund-raising talk. Tickets cost just £8 and are available from the Heritage Centre or by calling 01628 780555. Our next free family fun day will be on Wednesday 24th August, when we will be celebrating all things Spitfire! You can drop in to the museum at 18 Park Street any time between 10.30am and 3.30pm. Join us for a day dedicated to the magnificent Spitfire. Try on replica flying equipment,including flying helmets and goggles, have your photo taken as a Spitfire pilot and enter a competition to design and fly a paper plane and win a flight in our superb Spitfire simulator! On Thursday 18 August between 10am and 3pm volunteers from Maidenhead Heritage Centre will be at the Friends of Maidenhead shop in the Nicholsons Shopping Centre in the middle of Maidenhead. In particular we want to discover what people who have never visited the Heritage Centre would like to see in their local museum. If you are one of our ‘non-users’ please call in and talk to us! From 1pm to 3pm our learning officer will be running FREE craft sessions for children. Our next free family fun day will be on Wednesday 17th August, when you can drop in to the museum at 18 Park Street any time between 10.30am and 3.30pm. The link to our History of Skindles exhibition continues with the Royalty Chef! We have several historic menus on display in the exhibition, so this is a chance for youngsters to design their own delicious and decadent 1930s menu to serve to royalty, who were frequent visitors to Skindles Hotel, along with the film and pop stars of the day. We are proud to have just been awarded a 2016 Certificate of Excellence by the popular TripAdvisor website. The glowing reviews the museum has received on TripAdvisor must be one reason why in the last 2 weeks of July we welcomed visitors from from Denver USA, South Africa, Poland, Spain, Denmark, Australia, Sweden, Canada and New Zealand. 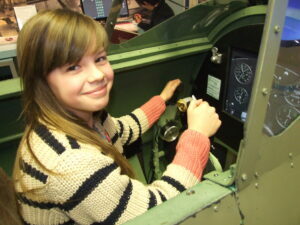 Not to mention couples who made special journeys from Leicester and Rutland to fly our fabulous Spitfire Simulator. Word is getting around – please tell your friends!